I think like many people out there, I am appalled at the lackadaisical attitude of our law enforcers in relation to the mentally unstable women who drove into the MFA premises. I don't know how it happened but I think it all boils down to complacency and this smug attitude by our government that once they enact a law, it will be good enough and we obedient citizens will quietly obey it without questions. This is why we have so many "fine" laws but no enforcement. 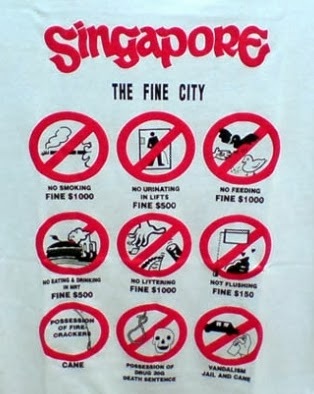 Seriously, in my over 51 years of existence, I do not know anybody who has been fined for littering, smoking, spitting or jaywalking. In the past when I drove along the expressways, I will see a traffic police in a BMW or on a patrol bike. Nowadays, I hardly see any. And in the past I do see people doing CWO in the parks but I can't remember when was the last time I seen one. About the only government agencies that seems to be enforcing its law is HDB and URA. And I guess that is only because they outsource the parking enforcement duties to private organisation! Nparks, NEA, LTA the 3 main agencies probably has a very small pool of law enforcers. And probably in no big hurry to beef that up. My complain to LTA about motorcyclists riding along pavement was acknowledged with a standard reply but today there are more and more bikes riding along the office outside the stretch of walkway outside my office. Smokers are still smoking everywhere despite the extended no smoking area. And where are the Nparks people to catch poachers? Cyclists in MacRitchie, litterbugs at East Coast Park? The worst of the lot is our police! If nobody is badly hurt or killed they will not take actions. I think it is ridiculous that every time there is a fight and it does not result in a hospitalisation, the police will tell the victim to file a private summon! What they are doing is pushing the law enforcement to the victims themselves! Same with the stupid no cycling on the pavement law. When a minister can casually diss out impractical advice on recourse, obviously he is setting the direction for his people to not do anything and encouraging people to continue riding on the pavement. Obviously we have many laws but no enforcement and when there is no enforcement, we might just as well not have all these laws. And if there are laws and we have law enforcers who don't seem to care, then I don't know what going to happen to this country when the population really grow to 6.9m.